So you're pro gay rights (or just plain old human rights). And (say what?) you also happen to love Chick-fil-A's food. Well, up until a few weeks ago, that wasn't a problem. Look, no matter how much you support gay rights, you may have a breakdown and in a weak moment throw some Chick-fil-A down your gullet. 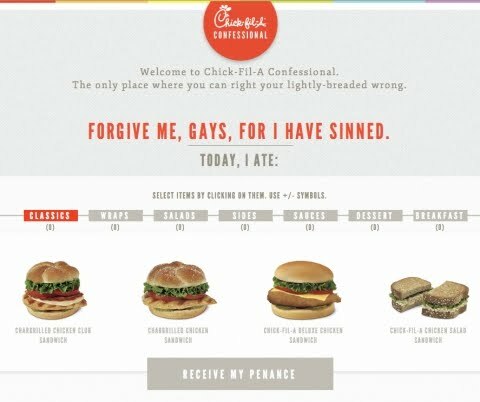 But it's ok, you can now repent with the Chick-Fil-A Confessional. And, you even get a penance, like donating to LGBT organizations. So don't be so hard on yourselves, chicken lovers.